aftermathâ€”often in wild and hilarious ways. The days leading up to the impending disaster are not at all unusualâ€”no portents of disaster, no signs of impending calamity. Bryce works his night shift at the hot dog factory, Isaac drives the bus to school, Evelyn attends a funeral. But when the electricity fails in the middle of the night on September 21, 1989, it marks the moment when everything will change: Hugo has arrived.The storm builds, the wind whips by faster and faster, and interpersonal dramas, grudges, and rivalries are dredged up along with the flotsam and debris. Meanwhile, flood markers, painted red, track the height of the water from past rainstorms, and as the creek level rises higher than ever before, so do the emotions of the townspeople. 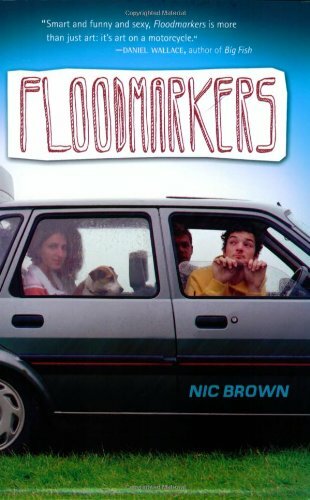 Alternating between weather forecasts and short stories, Floodmarkers is an exquisitely crafted day-in-the-life of a town. And as Nic Brown has us look bravely at the eye of the storm, he cleverly shows us that human nature can stir up a spectacular tempest all its own.